^ 1.0 1.1 1.2 Ashurst, Sam; Chapman, Matt. Joaquin Phoenix's Joker film release date, plot, cast, trailer and everything you need to know. Digital Spy. 2018-08-30 [2018-09-16]. （原始内容存档于2018-09-17）. 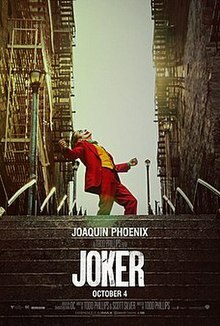 ^ 2.0 2.1 2.2 2.3 2.4 2.5 Production is Underway on Warner Bros. Pictures’ “Joker”. Business Wire. 2018-09-17 [2018-09-18]. （原始内容存档于2018-09-18）. ^ 3.0 3.1 Kit, Borys. Robert De Niro in Talks to Join Joaquin Phoenix in Joker Movie (Exclusive). The Hollywood Reporter. 2018-07-23 [2018-07-24]. （原始内容存档于2018-07-23）. ^ 4.0 4.1 Hood, Cooper. Zazie Beetz's Role in Joker Revealed. Screen Rant. 2018-08-10 [2018-09-17]. （原始内容存档于2018-09-18）. ^ 5.0 5.1 Kit, Borys. 'Joker' Movie: 'Deadpool 2' Actress Zazie Beetz in Talks to Join Joaquin Phoenix (Exclusive). The Hollywood Reporter. 2018-07-19 [2018-07-21]. （原始内容存档于2018-08-03）. ^ 6.0 6.1 Gonzalez, Umberto; Verhoeven, Beatrice. 'Joker': Frances Conroy in Talks to Play Mom to Joaquin Phoenix's Joker in 'Batman' Spinoff (Exclusive). TheWrap. 2018-07-24 [2018-07-24]. （原始内容存档于2018-07-24）. ^ Davis, Brandon. Brett Cullen Cast as Thomas Wayne in 'The Joker'. ComicBook.com. 2018-09-17 [2018-09-18]. （原始内容存档于2018-09-17）. ^ 8.0 8.1 Anderson, Jenna. Bryan Callen Cast in 'Joker' Origin Movie. ComicBook. 2018-07-31 [2018-08-01]. （原始内容存档于2018-07-31）. ^ Kroll, Justin. Joaquin Phoenix’s Joker Movie Eyes ‘Glow’ Star Marc Maron (EXCLUSIVE). Variety. 2018-07-31 [2018-07-31]. （原始内容存档于2018-07-31）. ^ Weintraub, Steve. Exclusive: Joaquin Phoenix on His “Unique” Joker Movie and Why It Scares Him. Collider. 2018-07-12 [2018-09-17]. （原始内容存档于2018-09-18）. ^ 11.0 11.1 Jr, Mike Fleming. The Joker Origin Story On Deck: Todd Phillips, Scott Silver, Martin Scorsese Aboard WB/DC Film. Deadline Hollywood. 2017-08-22 [2017-08-23]. （原始内容存档于2017-08-23）. ^ Masters, Kim; Kit, Borys. The Joker Movie: Warner Bros. Wants Class, Cachet and Maybe Leonardo DiCaprio. The Hollywood Reporter. 2017-09-01 [2017-09-05]. （原始内容存档于2017-09-05）. ^ Kroll, Justin. Joaquin Phoenix in Talks to Play the Joker in Todd Phillips’ Standalone Movie (EXCLUSIVE). Variety. 2018-02-08 [2018-06-15]. （原始内容存档于2018-06-15）. ^ 14.0 14.1 Kit, Borys. Warner Bros. Shifts DC Strategy Amid Executive Change-Up. The Hollywood Reporter. 2018-06-13 [2018-06-15]. （原始内容存档于2018-06-13）. ^ 15.0 15.1 Kroll, Justin. Joaquin Phoenix’s ‘Joker’ Movie Gets the Greenlight, Will Shoot in the Fall. Variety. 2018-07-10 [2018-09-18]. （原始内容存档于2018-09-19）. ^ Hood, Cooper. Joker Origin Movie Title & Release Date Officially Revealed. Screen Rant. 2018-07-18 [2018-09-16]. （原始内容存档于2018-10-19）. ^ D'Alessandro, Anthony. Todd Phillips’ ‘Joker’ Movie Heading Into Production This Fall With Joaquin Phoenix. Deadline. 2018-07-10 [2018-07-11]. （原始内容存档于2018-07-24）. ^ Yang, Rachel. See Joaquin Phoenix in Joker Makeup. Variety. 2018-09-21 [2018-09-21]. （原始内容存档于2018-09-21）. ^ Anderson, Jenna. 'Joker' Origin Movie Rumored to Be Targeting R-Rating. ComicBook.com. 2018-08-08 [2018-09-20]. （原始内容存档于2018-09-20）. ^ Erao, Matthew. Joker Origin Film Reportedly Wants Robert De Niro For Supporting Role. ScreenRant. 2018-06-18 [2018-07-18]. （原始内容存档于2018-07-28）. ^ Robert De Niro and Frances Conroy join DC's Joker origin film. flickeringmyth. 2018-07-24 [2018-07-26]. （原始内容存档于2018-07-25）. ^ Mueller, Matthew. Frances McDormand Turns Down Role in Joker Origin Movie. Comic Book. 2018-07-13 [2018-07-21]. （原始内容存档于2018-07-26）. ^ 23.0 23.1 D'Alessandro, Anthony. Alec Baldwin Joins Todd Phillips’ ‘Joker’. Deadline. 2018-08-27 [2018-08-28]. ^ Stedman, Alex. Alec Baldwin Drops Out of ‘Joker’ Movie. Variety. 2018-08-29 [2018-09-17]. ^ Drum, Nicole. 'Joker' Director Todd Phillips Teases Production With New Photo. ComicBook.com. 2018-09-02 [2018-09-18]. （原始内容存档于2018-09-19）. ^ Evry, Max. Unexpected First Look at Joaquin Phoenix as The Joker. ComingSoon.net. 2018-09-16 [2018-09-17]. （原始内容存档于2018-09-17）. ^ 27.0 27.1 MacDonald, Terrence T. 'Joker,' Joaquin Phoenix film about Batman nemesis, to film in N.J. locations. NJ.com. 2018-09-21 [2018-09-21]. （原始内容存档于2018-09-22）. ^ Chitwood, Adam. Brett Cullen Replaces Alec Baldwin as Thomas Wayne in ‘Joker’. Collider. 2018-09-17 [2018-09-17]. （原始内容存档于2018-09-18）. ^ Full ‘Joker’ Cast List Reveals Shea Whigham, Glenn Fleshler, and More. Collider. 2018-09-17 [2018-09-17]. （原始内容存档于2018-09-18）. ^ Hildur Gudnadottir to Score Todd Phillips’ ‘Joker’ Origin Movie. Film Music Reporter. 2018-08-23 [2018-08-28]. （原始内容存档于2018-09-17）. ^ McClintock, Pamela; Kit, Borys. 'Joker' Origin Movie Lands Fall 2019 Release Date. The Hollywood Reporter. 2018-06-18 [2018-07-18]. （原始内容存档于2018-07-19）. ^ Shanley, Patrick. Joaquin Phoenix's Joker Unveiled in First-Look Photo. The Hollywood Reporter. 2018-09-16 [2018-09-18]. （原始内容存档于2018-09-17）. ^ Patches, Matt. Joaquin Phoenix’s Joker makeup revealed in behind-the-scenes footage. Polygon. 2018-09-21 [2018-09-21]. （原始内容存档于2018-09-21）.